Racers will jump off two finger piers on the Fairhope Pier and swim 1/3-mile to the shore. Map design by Graves Creative. Racers will jump off of both finger piers to speed up the start of the race. Racers 1-399 will jump off the first pier and racers 400-800 will jump off of the second pier. Racers will be numbered based on swim time with both Racer 1 and Racer 400 being the fastest. First-time racers will also start at the end of both lines. 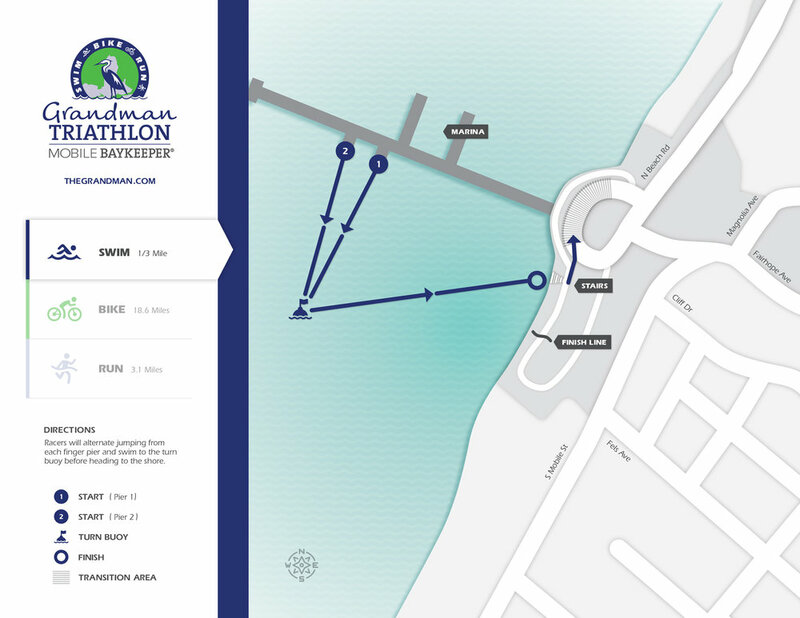 Please double check your active registration to ensure we have the correct swim time. Swimmers begin the race by jumping off of both finger piers on the south side of the Fairhope Pier, then swimming approximately 200 yards south and turning east toward the shore before exiting onto the small staircase on the beach. Racers will line up near your matching swim cap color and individually according to race number (selected based on racer entered swim time at registration). Racers participating in the swim portion of the race should be able to swim 1/3-mile before race day. Swim caps are provided and wetsuits should not be necessary. Kayaks will be patrolling the course to guide swimmers and to offer support to any swimmers in distress. Buoys will be set in place to mark the course. The bike course covers 18.6 miles of beautiful rolling hills traversing under giant live oaks and finishing with gorgeous views of Mobile Bay. Click to enlarge. Map design by Graves Creative. Racers will leave the transition area, bike straight uphill and then turn right onto South Section Street/Highway 3 and continue to Greeno Road/U.S. Highway 98. Racers will then turn right onto Greeno Road/U.S. Highway 98 then make a quick right turn onto Scenic Highway 98/Mobile Street and follow this back to the race site. Total length of bike course is 18.6 miles. 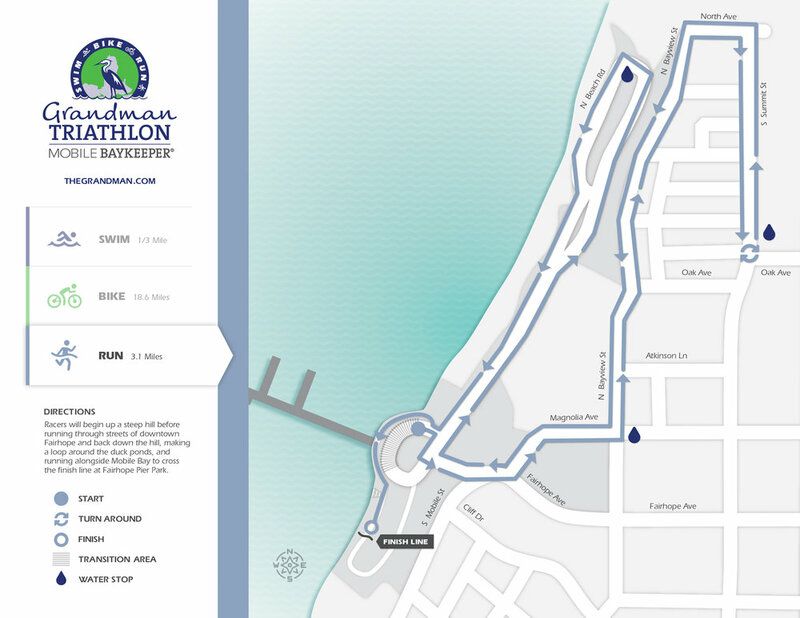 The run course takes competitors through side streets of spectacular Fairhope, AL with views of Mobile Bay throughout. The course sets up a dramatic conclusion to the race with a finish line set mere feet from the Bay. Map design by Graves Creative. The run is 3.1 miles (5K) and will start by heading directly up the hill (on the north side of the hill, not the south). At the top of the hill, racers will make a left turn and head around Knoll Park to Bayview Avenue. Racers then follow Bayview to North Avenue (turn right) and then another right on Summit Street. Racers continue running on Summit to Oak Street, turn around and head back to the Pier following the same path. At the bottom of the hill, racers turn right and make a loop through the park (all the way to the duck pond) and along the sidewalk by the pier. The finish line will be on the south side of the traffic circle in Fairhope Park. Transition Area opens at 5:30 a.m. and closes at 7 a.m. Map design by Graves Creative. There will be one entry into the transition area and one exit to the transition area. 1. Transition area will be open to racers at 5:30 a.m.
2. Only body-marked racers allowed into the Transition area. 3. Transition area will be closed for setup at 7 a.m.
4. Transition area will re-open to allow racers to remove items at 10:30am. Only five racers are allowed into the transition area at a time to gather their belongings while racers are still on the race course. Once the last racer has crossed the finish line, the transition area will be open. 5. Your bike number must match your body marking number to leave the transition area. 6. You MAY NOT reach over blue netting to remove anything from the transition area. 7. Please be patient and give other racers the courtesy of completing the race. 8. If you need something important to your health and safety (such as medicine), please leave it at the information tent or with a medical officer. Special Thanks to Graves Creative for designing our race course maps and supporting the Grandman Triathlon! Learn more about their work at graves-creative.com.